First you need the printable. It's one page with hearts and banners and arrow accessories. You can cut out the hearts and use them by themselves or make a fancy Valentine with a heart, a banner that says “You Make My Heart Glow” and a glow stick arrow shooting through it. Do whatever you like! If you're in a hurry, the quickest Valentine to make is the heart on a glow stick. Just cut out a heart, tape it on to a glow stick and for extra fun you can cut out a banner and glue it on the front of the heart. Cut out a heart. Punch 2 holes about 1″ apart in the center of the heart. Insert glow stick through holes. Cut out the front and back arrow accessories. Tape each piece of the arrow on to the front and back ends of the glow stock. Cut out a message banner. Glue on to center of heart. Optionally, you can also write your own message on the hearts. Add a little glitter or personalize however you like. You'll have a blast making these cute little heart and arrow glow stick valentines and the kids will love them! If you need help finding glow sticks, check out your local Dollar Tree or Amazon always has glow sticks in stock. 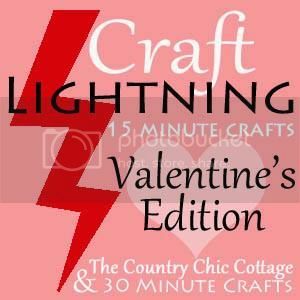 Hop on over to Angie's site to find more Valentine Craft Lightning goodness! These are so cute!! I love the idea. A couple of years ago, I did Star Wars valentines with my littles, using glowsticks as light sabers. They were a big hit. We accidentally cracked a bunch of them during assembly, though. Love these Printables! Looking forward to working more closely with you! Amazing as always Jen! So nice to meet you at CHA!